Meier Tobler offers a sustainable, ecological and economical solution by replacing MPG-based coolant with Greenway® Neo in the secondary cooling system of an outdoor ice rink. The city of Sion, in the Swiss district of Valais, is active in promoting culture and sport. 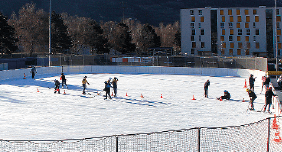 Every year, during the winter season, it provides two ice skating areas for use by hockey and skating clubs, schools and the general public. In 2017, the city asked the Refrigeration department at Meier Tobler to carry out analysis of the cooling system used to freeze its 1,800 m² outdoor skating rink. The instructions were clear: implement an ecological energy strategy for the future that meets the challenge of temperature variations in the city. Sion is surrounded by mountains where the outside temperature can reach 28°C in the early part of the season, while the frozen surface must be kept at a constant -8°C. Meier Tobler are building technology specialists and have been operating in Switzerland for several decades. They replaced the old system that used to work with a refrigerant with a GWP greater than 3,900, with a CO2 chiller (GWP=1). They initially re-used the mono-propylene glycol heat transfer ﬂuid to ﬂow through the 94,400 m of piping to form the ice sheet. In 2018, Meier Tobler's technical team identified that expected performance levels were not being achieved and so carried out analysis on the heat-transfer ﬂuid. This showed degradation of the glycol which was probably associated with the marked temperature ﬂuctuations experienced over recent years. Cyrille Jaunet, Industrial Refrigeration Sales Advisor, explains: " In keeping with our vision, it seemed "natural" to us to recommend an eco-friendly, plant-based heat-transfer ﬂuid. In a meeting with Climalife, John Padilla introduced us to Greenway® Neo and its operating conditions, which are very similar to those of conventional ﬂuids but with significant advantages, such as its lower viscosity. This allowed us to reduce the power used by the circulation pumps “. In September 2018 the coolant circuit was drained, cleaned and refilled with 18,000 litres of Greenway® Neo -30. Since then, the season has been fully operational and performance levels have reached expectations. A few adjustments to the electrical equipment gave an immediate reduction in consumption of 20%. At a constant speed, the pumps draw less current. With five piston compressors running on CO2, the refrigeration production gave a better modularity of power with a COP stability of between 10 and 100% of load.